Our astrologer will study and analyze your horoscope along with the dasha periods and provide you the most appropriate answers to all your queries regarding business as per your planetary position in your Natal Chart, Moon Chart, Navamsha and the concerned Divisional Chart Career Problem Solutions so that you can be assured that your career venture is fully supported by your stars.Career Problem Solutions. 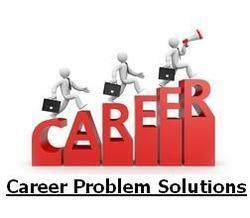 If your experiencing problems in your career do not worry we will help you to overcome the bad periods and suggest you with appropriate remedial solutions to improve your career related problems. Due care is taken while analyzing your horoscope and suggesting unique and usually inexpensive remedies in solving all kinds of career problems. Our remedies are completely safe and give the desired results.